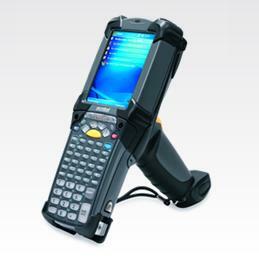 Designed for workers inside your four walls, the MC9090-G offers advanced data capture options and integrated wireless LAN/PAN plus a comfortable ergonomic pistol grip to enable real-time data collection in scan-intensive environments — in the warehouse, on the loading dock, out in the yard and in the back room or out on the sales floor of a retail operation. The MC9090G is our most popular mobile computer. Wavelink comes pre-licensed so you can connect to Pronto or SAP easily. See how tough the MC9090 Brick/Gun series is! Flexible always-on connection maximises mobile worker productivity, while technology differentiating features deliver superior, reliable wireless connectivity; compatible with any WLAN in the world. Maximises the value of your applications — and software development investment. Wirelessly synchronise, print, and connect to a headset.